Put a delicious twist on a traditional Irish dish by swapping the bacon for ham and baking it in the oven with puff pastry on top. This easy dinner recipe is perfect for a St. Patrick’s Day party. 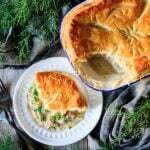 Ham and cabbage pie is a classic comfort food everyone will love! This recipe was originally published on March 9, 2018. 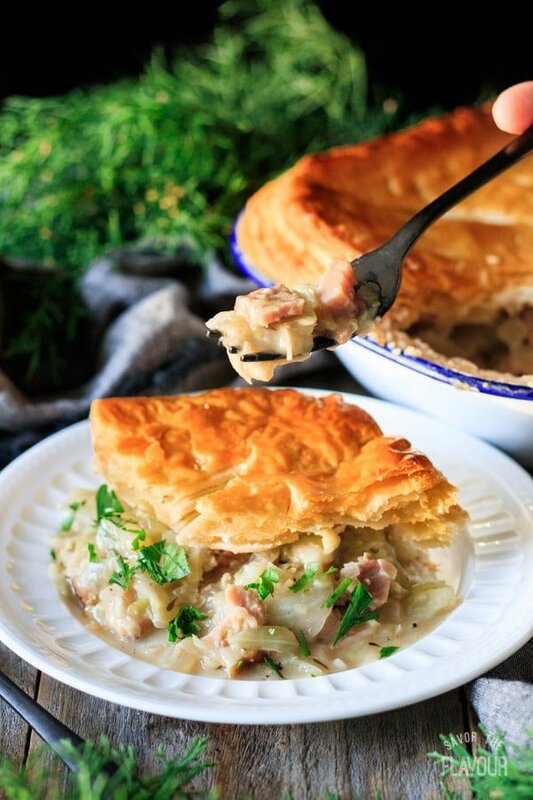 This ham and cabbage pie is actually a twist on a classic Irish dish: bacon and cabbage. I’ve opted to use leftover spiral-sliced smoked ham here instead of bacon. I love how the flavors blend so well with the cabbage! Plus, it’s a hearty meal that keeps really well in the fridge for a few days. Leftovers, anyone? Where did ham and cabbage come from? 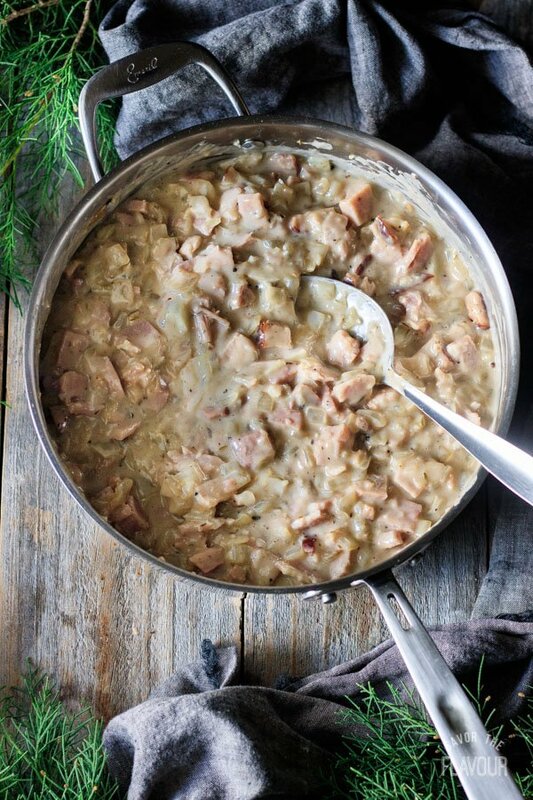 Bacon and cabbage (or ham and cabbage) is an Irish dish. It was popular because the Irish people grew cabbages and raised pigs, so they had an ample supply of the ingredients. Bacon and cabbage was often served with a white sauce. 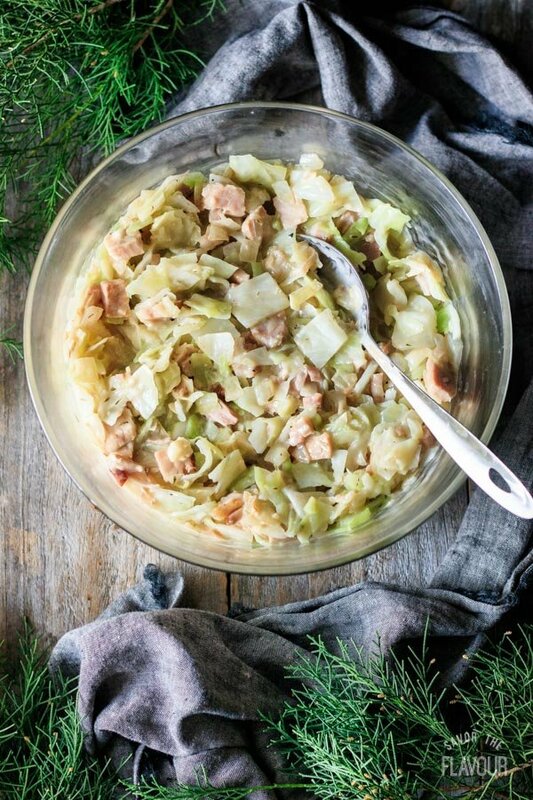 Is ham and cabbage healthy? 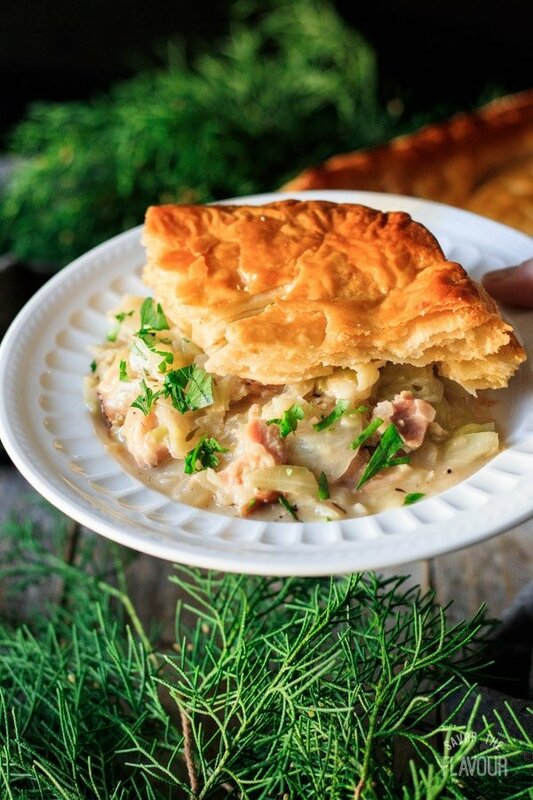 Yes, the ham and cabbage filling for this pie is healthy. It’s high in protein, fiber, and vitamin C and low in carbs and calories. Leaving off the puff pastry lowers the calories to 144 per 2/3 cup serving, fat to 8.1g, cholesterol to 25mg, and carbs to 14.5g. If you’re watching your diet, just eat the filling by itself. Let the pie cool to room temperature. Cover the pie plate tightly with aluminum foil. 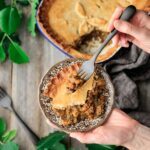 Can ham and cabbage pie be frozen? Yes, you can freeze the ham and cabbage filling in an airtight container or zip-top bag for 2-3 months. Defrost the filling and bake with the pastry on top once thawed. It’s best not to freeze cooked puff pastry. Gather the ingredients for the filling. 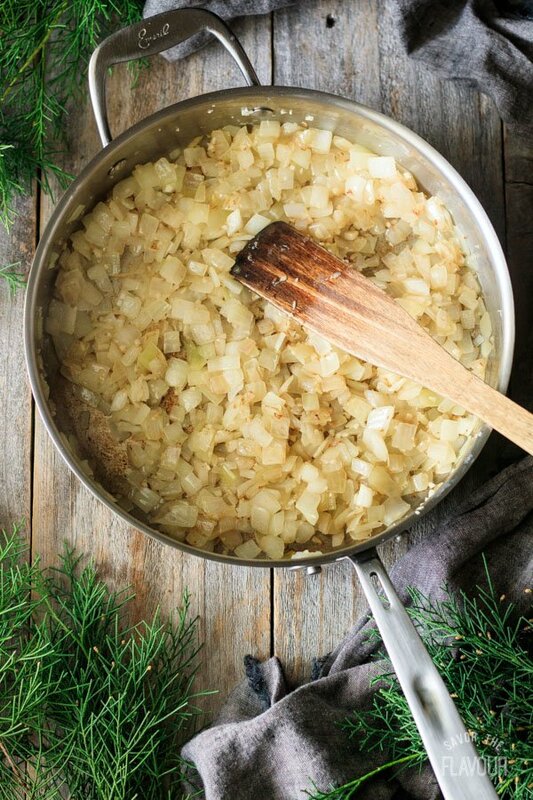 Sauté the onions and garlic in a large skillet over medium-high heat until golden. Quarter the cabbage, then cut into bite-sized pieces. Boil for 8-10 minutes, until crisp tender, then drain and rinse with cold water. Melt the butter in the same skillet you used for the onions. Add the flour and whisk for a couple of minutes to cook the flour. Whisk in the milk and chicken stock and cook for a couple minutes, until thick. Stir in the ham and onions and heat through. Mix the gravy and cabbage together until blended, then set aside to cool. Spread the mixture into a 6-cup (1.4 liter) pie dish and top with puff pastry. Brush with beaten egg to get a rich golden crust, then cut a few vent holes..
Bake at 400 F for until the pastry is a rich golden brown, about 35 minutes. 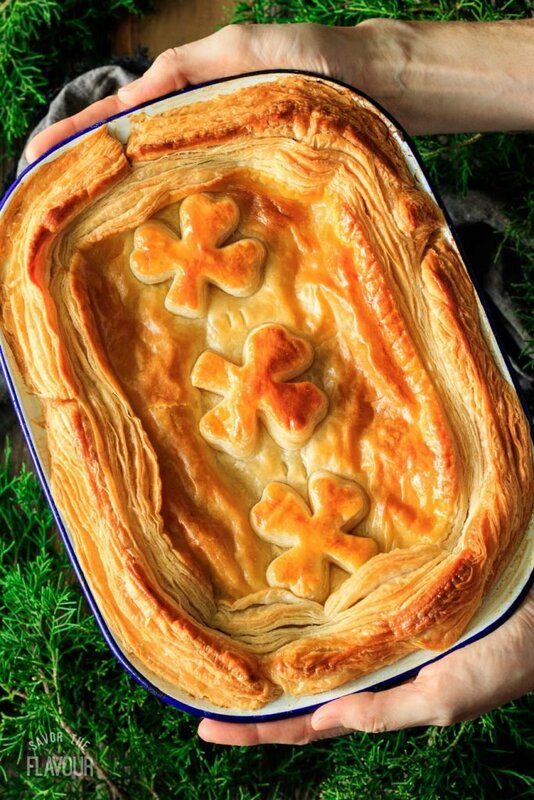 If you’re making this pie for St. Patrick’s Day, you can also top the pie with shamrocks for a decorative touch. Are you ready for some Irish food with a twist? I know your family will enjoy having this on St. Patrick’s Day or anytime of year! Hungry for more? 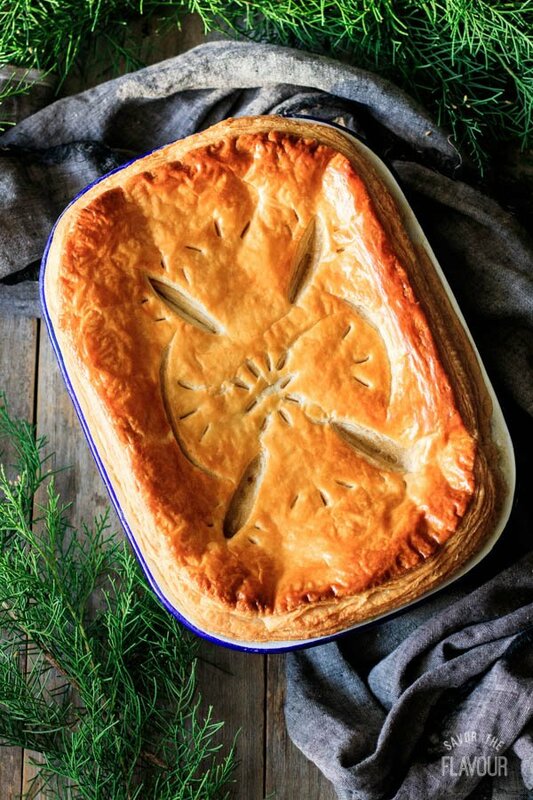 Check out these fantastic savory pie recipes your family will love! 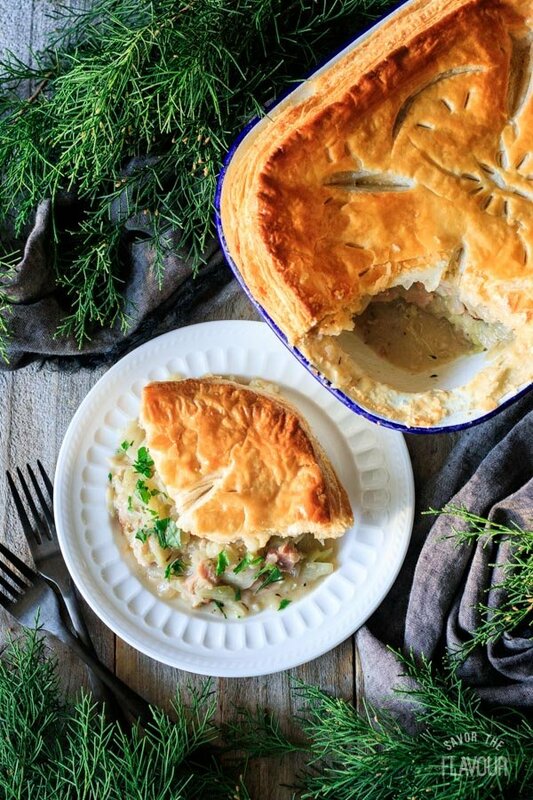 How to Make Dingle Pie: this Irish pie is made with leftover roasted lamb and lots of veggies. 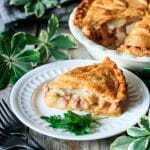 Cheesy Ham and Potato Pie: a flaky cheese pastry, cheese sauce, ham, and onions make this pie really delicious. 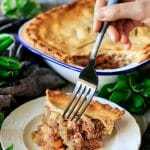 Old Fashioned Corned Beef Pie: use WW2-era tinned corned beef to make this yummy dinner. 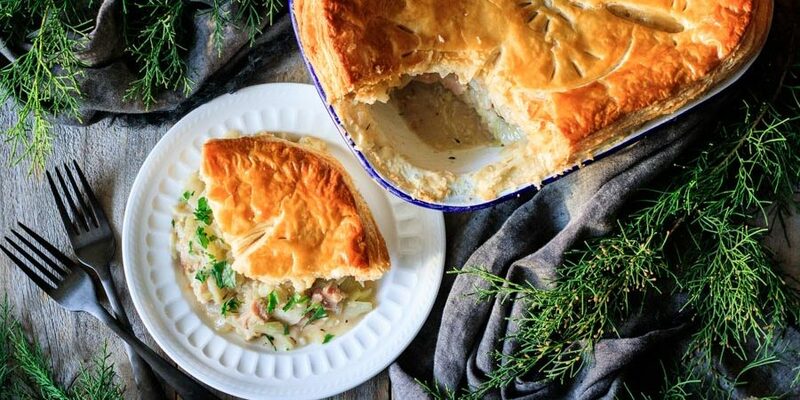 The pleasure of a 5-star review of this ham and cabbage pie would be greatly appreciated. Remove the stem and outer leaves from the cabbage, cut in wedges, then chop in bite-sized pieces. Rinse in a colander, then place in a large Dutch oven and add 3 inches of water. 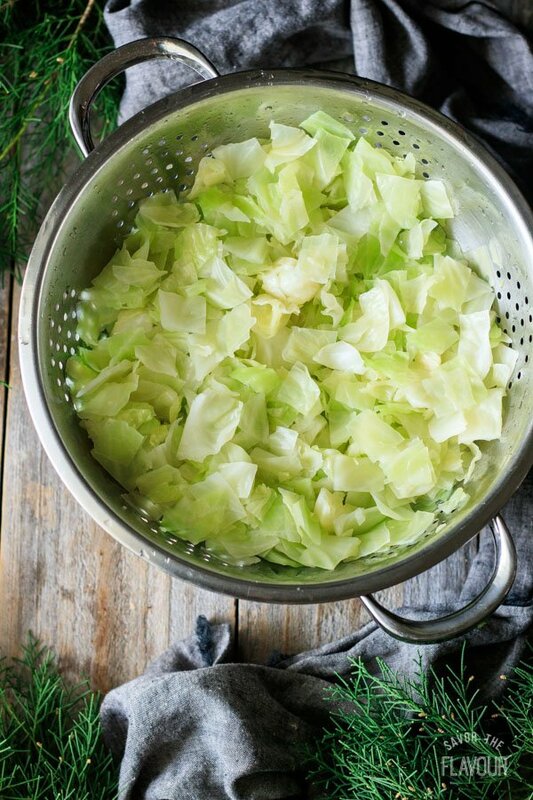 Cover and bring to a boil, then let the cabbage simmer, covered, until crisp-tender, about 8-10 minutes. Drain and rinse with cold water. 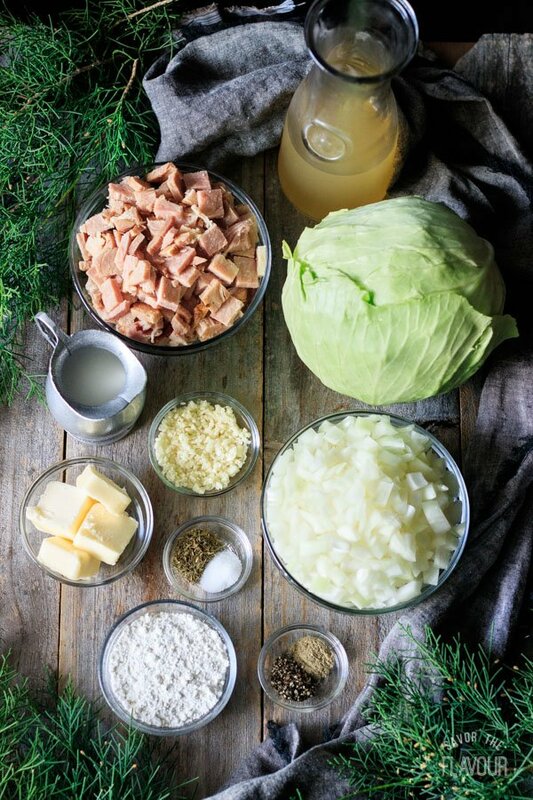 While the cabbage is cooking, cut the ham into bite-sized pieces and set aside. Chop the onions and mince the garlic, then saute with the 2 tablespoons of butter in a large skillet until golden brown. Spoon into a bowl and set aside. In the same skillet, melt 3 1/2 tablespoons of butter and whisk in the flour. Cook over medium heat for a couple minutes, whisking constantly. 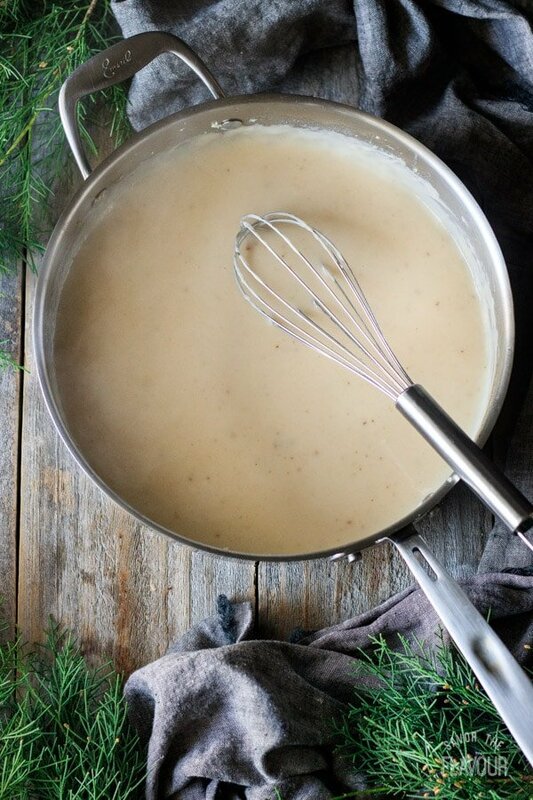 Whisk in the milk, then the chicken stock. 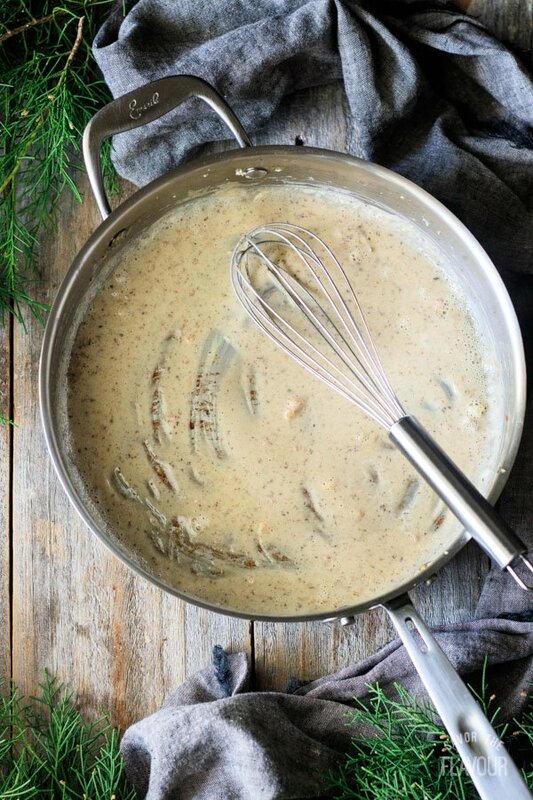 Keep stirring until the gravy has thickened, then season with salt, pepper, dried thyme, and sage. Stir the sauteed onion mixture and chopped ham into the gravy and heat through. Spoon the gravy into a large bowl and stir in the cabbage until it’s well mixed. Let the filling cool before you put the pastry on top. Spread the filling evenly in a 6-cup (1.4 liter) capacity pie dish. Roll out the chilled rough puff pastry and cut out a lid to fit on top of the pie. Use the remaining pastry to cut strips of pastry to go around the lid of the pie plate. Brush the lip of the pie plate with beaten egg and stick on the strips of pastry. Brush the pastry with more beaten egg, then stick on the lid, pressing the edges firmly to seal. 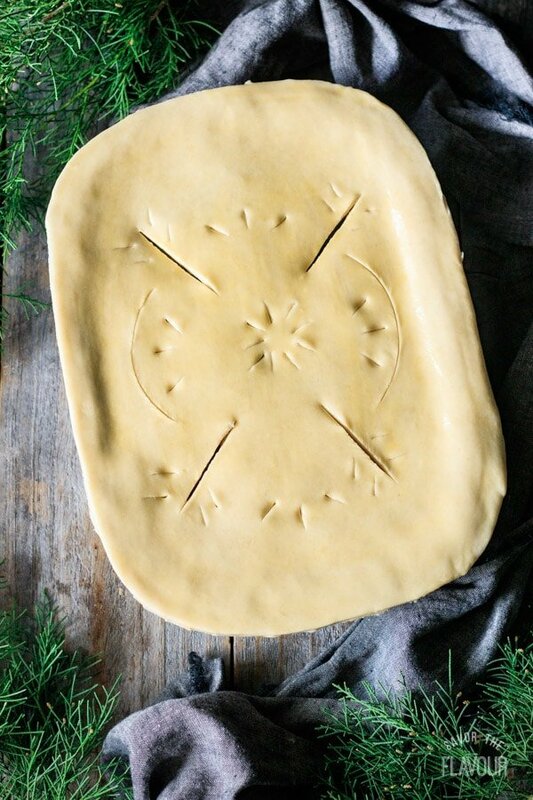 Brush the whole pie with beaten egg and decorate with any scraps of pastry. Cut a few vent holes to allow the steam to escape. Bake at 400 F for about 35 minutes, until the pastry is a rich golden brown. Cover any areas of the pastry that are darkening too quickly with aluminum foil. Let the pie cool on a wire rack for about 15 minutes before serving. This pie keeps very well in the fridge for a few days, so you can enjoy the leftovers! Just cover the pie plate with aluminum foil. 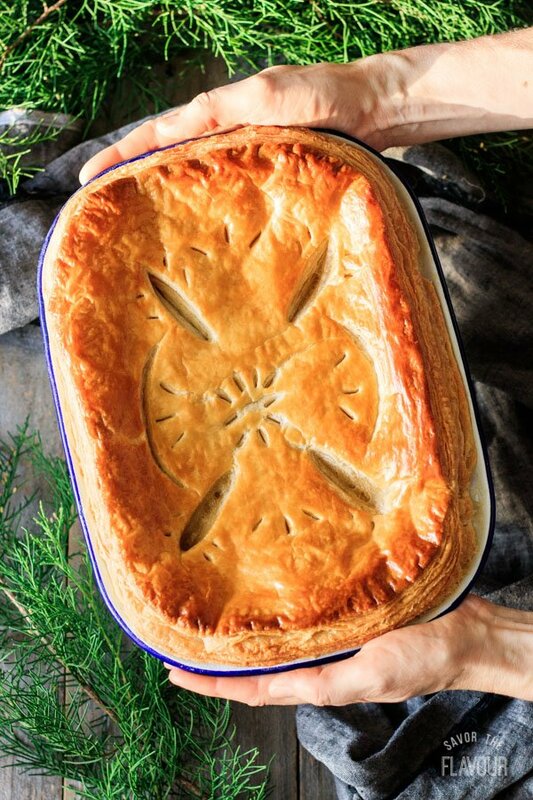 The pleasure of a 5-star review on this ham and cabbage pie recipe would be greatly appreciated. Emma — I tried to print the recipe for the Ham and Cabbage pie and received an error! I’d love to print this recipe, just wanted you to know. Hi Kathleen! I’m so sorry to hear that you encountered an error. Maybe refreshing your browser would solve the problem! Please let me know if you have any more trouble.